Stars appear round in these pictures whereas protoplanetary disks, or proplyds (PRO-p-lid-s), often appear to be elliptical. Another help is to use image processing software (like NIH Image or ImagePC) to magnify & change color tables in this pict or tif image to get a better look. Today, most astronomers agree that stars form from the collapse of enormous interstellar clouds of gas. The material that is left over from one of these collapsed clouds aggregates into planets. If this scenario is true, then there should be millions of planetary systems just like our own. Astronomers have spent lifetimes trying to build telescopes strong enough to see planets orbiting other stars. This is an enormously difficult task and, to date, no extra-solar planets have been seen. The problem is that stars are many, many times brighter than any planets around them; subsequently, planets are hidden in the glow of their parent star. An astronomer working at the closest star to our Sun, a star called Proxima Centauri, wouldn't be able to see any of the planets of our solar system even with a telescope as fine as the Hubble Space Telescope (HST). So, astronomers have to look for indirect evidence. One indirect approach that astronomers take is to look for "wobbles" in the motion of stars. If a large planet is orbiting a central star, the gravity interaction between a star and a planet will cause the star to oscillate back and forth a tiny amount. This strategy has resulted in the discovery of a number of planets (current list). There are no pictures of these planets, but we know the planets are present indirectly because of how the central star moves. The more direct approach that astronomers use to find extra-solar planets is to look for protoplanetary disks that are obvious because they are in front of enormous nebulae. 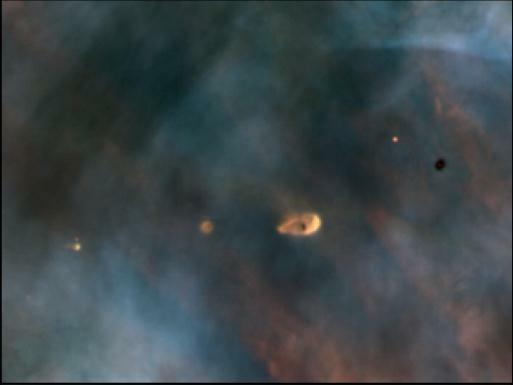 The first views of protoplanetary disks, or proplyds for short, have been captured by the Hubble Space Telescope in the constellation of Orion. The Hubble images of the Orion Nebula clearly distinguish the central star from the disk. Hubble can see the disks because they are illuminated by the hottest stars in the Orion Nebula or they are seen in silhouette against the bright nebula. However, some of these proplyds are bright enough to have been seen previously by ground-based optical and radio telescopes as stars. Hubble's resolution has allowed astronomers from Rice University to determine accurately the mass of the outer rim of the disk. It turns out to be at least several times the mass of our Earth. The entire disk is 53 billion miles across, or 7.5 times the diameter of our solar system. The central, reddish star is about one fifth the mass of our Sun. These protoplanetary disks captured by the Hubble provide direct evidence for how planets like those in our planetary system form. Their abundance in this young star cluster shows that the basic material of planets exists around a large fraction of stars. This reinforces the probability that many stars have planetary systems. 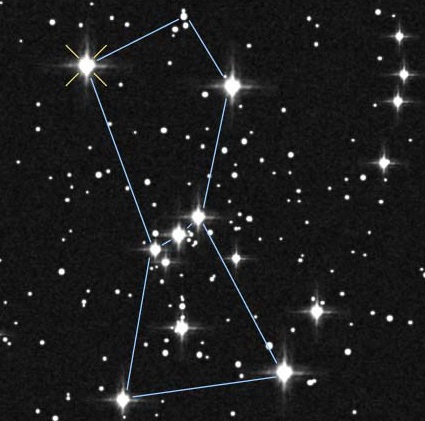 This image compliments an earlier observation of the star Beta Pictoris.